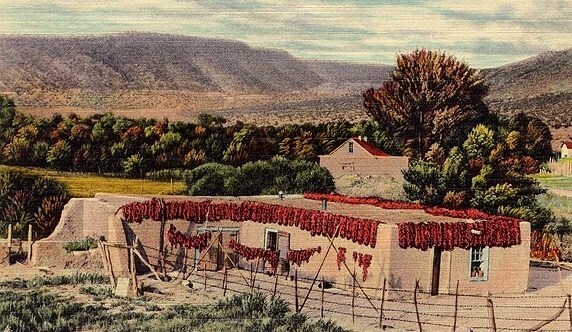 Every Labor Day weekend the small town of Hatch, New Mexico comes to life with it's annual chile festival. Up to 30,000 chile lovers descend on the town to celebrate the annual harvest. Similar to Anaheim and California chilies, the Hatch varieties are much hotter and prized for their exceptional flavor. You can order Hatch Chilies online from the local growers, either fresh or frozen, and you may be able to find them canned and roasted at your local market. I read somewhere that Whole Foods carries them while they are in season, from mid-August 'til mid-September. I made a trip to our local Whole Foods yesterday hoping to find a huge bin overflowing with the shiny beauties. My heart sank when the manager told me they came and went and were completely sold out. Lo and behold, out of the corner of my eye I spied a small stash of rejects on a shelf high above my head, I was ecstatic. I have been counting the months until their arrival so I could make this Hatch Chile Apple Cobbler from chef Jamie Samford of Central Market in Texas. Roasting the chilies is a little time consuming but so worth the effort. You can roast them on your gas grill, over an open flame or like I do, char them until their skins are blistered under a hot broiler. As they were roasting, I sat in front of my oven with the door open, inhaling the glorious fumes from the blackened peppers. Once you take the chilies off the heat, place them in a paper or zip lock bag while they are cooling, this makes it easier to peel off the skin. The cobbler baked for 45 minutes in my 10 inch dutch oven with 10 coals around the base of the oven and 24 on the lid. After 30 minutes I moved the center coals to the outside of the lid as the center was perfectly browned. Imagine the aroma of chilies, apples and butter steaming from your dutch oven, I could hardly wait to taste it. If you're a chile lover you have got to give this unique dessert a try, it's like sweet meeting heat under a rich, crispy crust. The hotness of the Hatch chilies really comes shining through, try to use them in the recipe if you possibly can. Did you know one fresh medium sized chili has as much vitamin C as 6 oranges? Also hot chilies help to speed up your metabolism and burn calories faster, so no excuses for not making this unusual cobbler. Surprise your guests with the secret ingredient at your next dutch oven gathering or pot luck dinner, it's bound to be a hit and a real conversation piece. In a large bowl, combine the apples, brown sugar, chiles, vinegar, 1/4 tsp cinnamon, 1/4 tsp salt, allspice and 1/8 tsp nugmeg. Toss until apples are uniformly coated. Spoon apple mixture into prepared dutch oven. In a medium bowl, combine the sugar, flour, lemon zest, 1/8 tsp cinnamon and 1/8 tsp nutmeg; mix well. Spread over the apple mixture and press firmly to flatten. Bake at 375 degrees for 45-50 minutes or until brown and bubbly.